Once you've installed PDF2XL, you must activate it before you can use it. In most cases, activation is short and simple. If your computer is connected to the internet, PDF2XL can connect to Cogniview's activation server and handle the activation automatically. If your computer is behind a firewall that blocks this kind of operation, you can also activate via Cogniview's website. In case none of the above methods worked, or your computer just isn't connected to the internet, you can activate via email or fax. 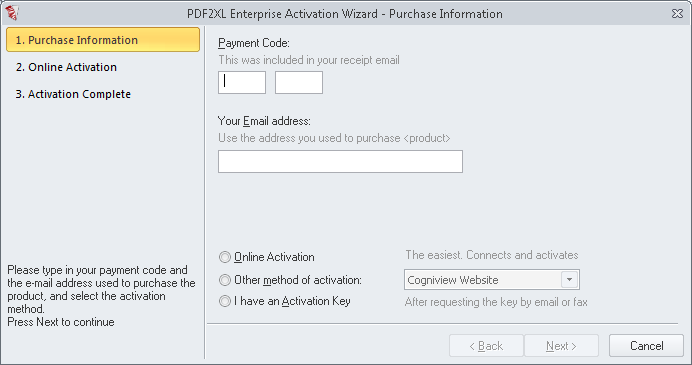 In order to activate PDF2XL you need to prepare your payment code and your email address. You can find your payment code in the purchase confirmation email or fax that you received after buying PDF2XL, and it is also available in the post-purchase webpage that is displayed after buying PDF2XL online. However, if you did buy online, keep in mind that PDF2XL cannot be activated until the payment is authorized, which may take several minutes. The email address you need is the one you provided when you purchased PDF2XL. Press Yes will run PDF2XL again in Administrator Mode, which will require your approval. After the activation has been completed successfully, you will not need to run PDF2XL in Administrator Mode again.